Every year I always make a bulk craft that I give to everyone, usually with some variation. For anyone who has kept up with or looked back upon my blog, you might remember last years crafting, for which I made homemade mini pies, waterless snowglobes and gift bags. Find the waterless snowglobes here! My goal for crafting this year was that I wanted to make little packages, where everything was related and everything was homemade. Thus, I thought instantly of my favorite holiday crocheting, Potholders! They're quick, they're easy and everyone loves them. (and honestly, who can't use another potholder?) Then I got to thinking, why stop at just potholders? I've been hanging on to these patterns for bath mitts, loofahs and washclothes, why not try out one or two of those? So now, I'm fleshing out my ideas and I start to search. I found a total treasure trove at one of my favorite recipe websites, AllRecipes.com. Here are a couple of links that I loved from that website. After devoting hours (and I mean hours) to finding the ones that sounded good to me, and then letting my daughter make the final decision, making the lists, I was finally ready to begin execution. I already had the jars at home, along with the majority of the spices that I needed. I went through all the recipes, calculated how much flour, sugar, and other things I would need, along with the special ingredients I would need to find or substitute for. 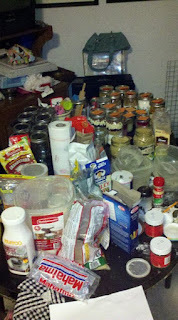 I gathered my jars, sanitized my lids and left them to dry while I went to the store. I ended up spending around $75 getting all the items that I needed, which may sound like a lot, but just wait until you hear how many it made! 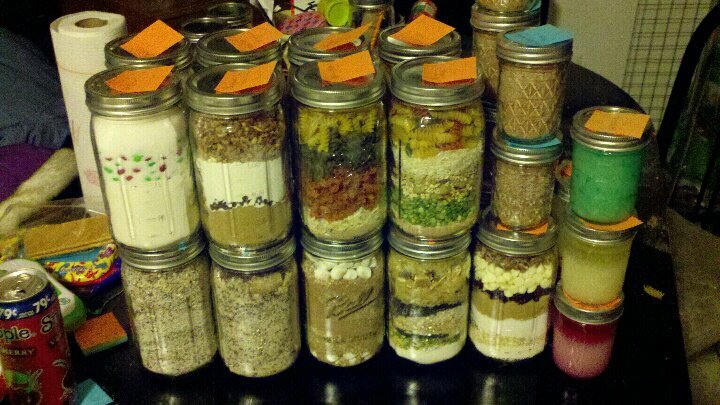 I ended up making 3 different soups in a jar, 3 different cookies in a jar, and 4 different drink mixes in a jar. Canning Jars and lids- you can use many different sizes, depending on the recipe. I use 1 quart for my soups and often times smaller for drink mixes. Canning Funnel - MUST HAVE! It just makes everything way easier! This is probably why my husband runs screaming every time that I say "It's time for holiday crafting!!" Those look so pretty and yummy! Wonderful job! i am searching for an Iowa Hawkeye pattern to cross stitch on an afghan...I want to make one for my son and grandson but don't know how to go about it I am planning to do an afghan stitch pattern for the blanket but am a bit leery of trying to put on the Hawkeye freehand with out a pattern HELP !!!! !